English Professor Major Jackson’s Full Professor Lecture, “The Dadaab Suite and Other Poems,” Tuesday, October 4, at 5:00 p.m. Dadaab, Kenya is the home of the oldest and largest refugee camp administered by the United Nations High Commissioner for Refugees. The camp was built for 90,000 refugees in 1991 as a consequence of the civil war in Somalia. Currently, the camp is now host to 380,000 people, and since the beginning of the summer, the current famine in Somalia has swelled those ranks even higher. As one reporter wrote, “this is one of the most desperate places on Earth.” As part of a cultural diplomacy trip sponsored by the United Nations, the United States Department of State, and the University of Iowa International Writers Program, Poet and Professor Major Jackson visited Dadaab to conduct creative writing workshops, meet with aspiring writers within the camps, and witness the current crisis in the northeastern region of Kenya. Professor Jackson will present a multi-media presentation of his experience and read new poems that address war, the limits of witnessing as well as the resilient spirit of the Somalian people. 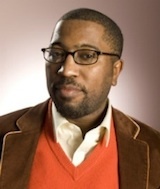 Jackson is the author of three books of poetry: Holding Company, Hoops, and Leaving Saturn, a finalist for the National Book Critics Circle Award in Poetry. He work has appeared in American Poetry Review, The New Yorker, Poetry, and twice in the anthology Best American Poetry (2004, 2011). He is a recipient of a Pushcart Prize, a Whiting Writers’ Award, a Pew Fellowship in the Arts and a Witter Bynner Fellowship from the Library of Congress. He is the Poetry Editor of the Harvard Review. He is the Richard Dennis Green and Gold Professor at University of Vermont. This entry was posted on Tuesday, October 4th, 2011 at 5:00 pm and is filed under Full Professor Lecture Series. You can follow any responses to this entry through the RSS 2.0 feed. Both comments and pings are currently closed.